Waiting in the car is not something I tolerate well. As young couples, if Wizard took too long inside a shop while I waited outside, I used to spend time fantasizing about taking off and wondering what his face would look like when he can't find the car. I may have moved the car once or twice just to freak him out hehehe. Waiting in the care with MONSTER is, how can I put it nicely, hell on my nerves. Nope there was no way around it, I have to be honest. 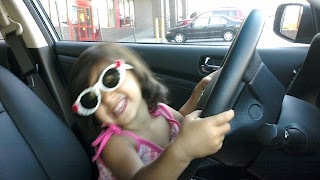 As she's getting more curious, it's a big big risk to let her entertain herself in the driver's seat. What with coins lying around, the car only a push button away from starting, a hand break we couldn't find for the first 5 minutes of leasing the car, there are a host of possibilities what she can do. In an attempt to entertain myself while keeping her occupied, I desperately try to find her favorite songs on the radio and encourage her to dance so she keeps busy enough to not notice that the cd slot may be a great place to hide coins yikes, Nephew has already done it to my brother's car. So who gets her attention these days? What songs do your toddlers like, and if they are still only dancing to Barney and not interested in Pop, introduce them to some Brooklyn culture! It's all the rage! he looooves "i look i look i see," and the hajj song that steals the tune from she'll be coming around the mtn.